Home Contests NNPC/Chevron JV National Art Competition 2018 for Nigeria Secondary Schools Students. 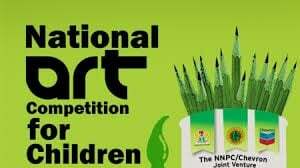 NNPC/Chevron JV National Art Competition 2018 for Nigeria Secondary Schools Students. Students in JSS1 – JSS 3 in Nigeria Secondary Schools. Medium – Posters, Water colour, Oil colour or Acrylic etc. School stamp and Principals signature. NoteParticipants are advised to adhere strictly to the theme and rules of the competition. All works must be original and unaided.